An affectionate and absorbing oral history raises questions of whether George Plimpton's amiable exterior concealed a man without qualities. 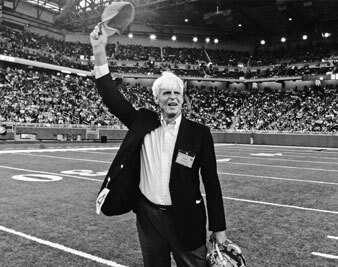 Plimpton was in the grip of a quixotic notion: to become the “last-string quarterback” of the Detroit Lions. When he arrived at the Lions’ training facility later that summer, he was greeted by the equipment manager, Friday Macklem, who declared, “I hear you’re a writer turned footballer. You’re going to play for us–making some sort of big comeback.” “That’s right,” Plimpton replied in his patrician accent. Macklem shook his head: “Well, I’ve been with Detroit for twenty-seven years, dishing out uniforms all those years, and I know if I’d ever been tempted into one, I wouldn’t be around to tell of it, for sure.” Not only did Plimpton survive his foray into professional football, but he also produced a fine book about it, Paper Lion, which enhanced his personal wealth and literary clout. The book sold extremely well, and Tom Wolfe included excerpts from it in his famous anthology The New Journalism, published in 1973. Reality sometimes intruded into Plimpton’s daydreams. In 1968, when Sirhan Sirhan shot Robert Kennedy in the kitchen of the Ambassador Hotel in Los Angeles, Plimpton helped to wrestle the pistol from the assassin’s hand. In George, Being George, Nelson Aldrich Jr.’s affectionate and absorbing oral history, we learn that Plimpton never wrote about Kennedy’s slaying, but that many years later, over cocktails with young staff members of The Paris Review, the journal he had led since 1953, he burst into tears at the memory of it. What followed was not the worst of George’s lifetime of mortifications, but he vividly recalled his squirming embarrassment in the backseat as the chauffeur got out of the car and set about changing the tire. He remembered how the tails of the man’s black uniform jacket flapped crazily in the wind of the passing traffic and how the sweat stood out on his face as he worked the jack up and down, up and down, while the rear of the car, with the little boys safe in their soft gray seats, went up, up, up. Family ties to Exeter–his father chaired the board of trustees–facilitated George’s arrival there in 1940, and he soon distinguished himself with his manners and sophistication, and his skill in athletics. He did not excel in the classroom, perhaps because, as a friend offers, “his mind was not set up for strict schedules.” For disregarding curfew, Plimpton was placed on disciplinary probation; and for aiming a Revolutionary musket at the football coach, he was expelled. Founded in 1953, The Paris Review was the brainchild of two young expatriates, Harold (“Doc”) Humes and Peter Matthiessen, who met in Paris in the winter of 1951-52. Humes was a mentally unbalanced former Navy cook who fled the United States in 1948 because, as he once declared, “the alternative to leaving was suicide or madness.” He wandered through the city’s summer heat dressed in a wool suit and homburg and sporting a silver-handled cane. Matthiessen was a handsome, gifted and supremely confident graduate of Yale (class of 1950). Born eight weeks after Plimpton, he also enjoyed a velvet upbringing. The son of a prominent architect, he was raised in Manhattan and Stamford, Connecticut–indeed, his parents owned an apartment in the same building where Plimpton grew up, 1165 Fifth Avenue–and he was in Plimpton’s class at St. Bernard’s. In 1952 he invited Plimpton, who was still in England, to come to Paris and assume the editorship of a new literary journal, which George agreed to do. INTERVIEWER: Are there devices one can use in improving one’s technique? There is no better guide to the art of writing than the stray volumes of Paris Review interviews, whose sprightly pages constitute a voluble history of twentieth-century English-language literature. Having chosen a purely literary path, how well did the editors acquit themselves? By and large, they leaned toward the conventional and the canonical. They had no desire to brush up against the avant-garde or the law, as Margaret Anderson did by serializing Ulysses in Little Review before its book publication in 1922, a decision that incurred the wrath of the US Post Office–which found some parts of the work obscene and refused to distribute copies of the magazine–and altered the course of fiction. We remember The Dial because it published T.S. Eliot’s The Waste Land, early drafts of Ezra Pound’s Cantos, the scintillating poems and prose of Marianne Moore and Thomas Mann’s Death in Venice. The editors of The Paris Review made no discoveries of that caliber: for the most part they preferred to reinforce reputations rather than scout young talent. Still, no one can sneer at their choices in the ’50s and early ’60s: stories by Philip Roth later included in Goodbye, Columbus; the first English translations of Italo Calvino; early work by Nadine Gordimer, Richard Yates and Stanley Elkin. If The Paris Review was not always wildly adventurous–Gerald Howard has persuasively argued that Ted Solotaroff’s New American Review surpassed The Paris Review, and every other literary journal, between 1967 and 1977–it was consistently impressive. Plimpton’s annexation of Manhattan’s social universe set him apart from some of the other early members of The Paris Review circle–including Peter Matthiessen, who was beginning to adopt a more obstreperous and combative stance toward the establishment. “I remember being present many years ago, in the 50’s, when by chance [Matthiessen] discovered his name was still in the Social Register,” William Styron told The New York Times Magazine in 1990. “I remember his rage at finding it there, and his determination to get it out.” By the late 1950s, Matthiessen, in full flight from his gold-plated roots, had embarked on a remarkable career that would include literary fiction, nature writing, environmental activism and left-wing pamphleteering. Fifty years on, he has more than thirty books to his name, including The Snow Leopard, an account of his spiritual pilgrimage to the Crystal Mountain in northwestern Nepal; Sal Si Puedes, a chronicle of Cesar Chavez’s advocacy on behalf of migrant farmworkers; Oomingmak, a record of his trip to Nunivak Island in the Bering Sea in search of rare musk ox calves; Men’s Lives, an elegiac tribute to the beleaguered baymen of eastern Long Island; and In The Spirit of Crazy Horse, a 600-page defense of Leonard Peltier, which sparked an acrimonious seven-year legal battle from which Matthiessen and his publisher, Viking, emerged victorious. Matthiessen was recently awarded the National Book Award in fiction for his long-gestating novel Shadow Country. But Matthiessen was thrown off balance by a revelation from Aldrich, which the latter shared with Donadio: a wealthy, shadowy cold war operative named Julius “Junkie” Fleischmann had provided $1,000 to The Paris Review in the journal’s earliest days. (In a recent interview, Aldrich said this information came from a letter in the possession of Plimpton’s widow.) Fleischmann was a major player in the CIA-funded Congress for Cultural Freedom, which helped to launch and sustain the London-based intellectual journal Encounter in 1953. In The Cultural Cold War, Stonor Saunders refers to him as “the CIA’s most significant single front-man.” These days, in the wake of Stonor Saunders’s account, Matthiessen is not especially eager to be caught in Fleischmann’s historical company, and in George, Being George he speculates that the $1,000 may have come from another Fleischmann–Raoul, the publisher of The New Yorker, who died in 1969. How significant, really, was Fleischmann’s contribution? In 1953, $1,000 was not an enormous amount of money, but neither was it an insignificant sum for a new, struggling literary magazine. Assuming Fleischmann’s commitment was limited to $1,000, The Paris Review would likely have survived without it. It should be emphasized that the CIA and its front organizations never made a full-scale commitment to The Paris Review, as they did to Encounter. (Indeed, it was funding from the CIA and the British government that transformed Encounter into one of the world’s most vibrant intellectual journals in the 1950s and ’60s.) The CIA also supported other small publications, including The Kenyon Review, Partisan Review, The Sewanee Review and several foreign journals like Transition. The Paris Review never benefited from that largesse, and Plimpton’s life was more stressful as a result: a survey of his voluminous correspondence at the Morgan Library reveals that he devoted a significant number of his waking hours, over many years, to the arduous task of fundraising. Cash was never plentiful: Larry Bensky recalls that in 1964-66, the years he staffed the Paris office of The Paris Review, the journal was operating on a shoestring. In assessing the history of the journal, how consequential was its early liaison with the CIA? In light of the paucity of scholarly material, the person most qualified to make that assessment is Peter Matthiessen. If he believes the waters have been “muddied” by recent revelations, then he should endeavor to cleanse them. But over the years, and to this day, Matthiessen, who says he quit the CIA in disgust in 1953, has been tight-lipped. On those rare occasions when he has discussed this matter on the record–Aldrich’s book being one of those occasions–his normally pellucid language becomes opaque. Coming from him, such reticence is disheartening. Since the late 1950s, Matthiessen has been an indefatigable activist and truth-teller. It’s difficult to think of another major American writer who has devoted himself to such a wide range of causes, movements and struggles, many of which involve pressing ecological and environmental matters. The result is a body of work, much of which appeared in William Shawn’s New Yorker, defined by political commitment, literary distinction, lived experience and action. Matthiessen, who is 81, has yet to undertake a memoir, but the moment for him to clarify the origins of The Paris Review has arrived, even if the questions at stake are primarily of interest to cold war historians, aficionados of little magazines and devotees of Frances Stonor Saunders, and even if the subject matter arouses in him a degree of personal discomfort. Such a reckoning may well enlarge his reputation rather than diminish it. The questions he should answer include: Why, in George Being George, did he float the name of Raoul Fleischmann when Aldrich had already informed him that Julius Fleischmann was the actual Paris Review donor? (It’s worth noting that Raoul’s name is absent from Stonor Saunders’s exhaustive and uncompromising account, while the book has many references to Julius.) Was Julius acting on his own behalf when he contributed that $1,000, or was he a conduit of funds from the US government? Did any of the other early donors, of whom there were at least eighteen, have direct (or indirect) ties to the CIA or its front organizations? As for Matthiessen, what did his CIA masters hope to achieve by allowing him to use the avowedly apolitical Paris Review as his “cover”? Were these the same men who backed Encounter, in which Julius Fleischmann was also a principal stockholder and which, like The Paris Review, was created in 1953? What were Matthiessen’s duties as a CIA agent in Paris in the early days of the cold war, and what were the precise circumstances of his departure from the agency? The letter from Doc was extraordinarily lucid for somebody who had literally lost his mind and was listening to implanted broadcasts from his furniture. He says he’s going to resign from The Paris Review unless Peter goes public with his story–he’s to be congratulated on coming out on all this, but he needs to write it in public in The Saturday Evening Post or, God help us, in The Paris Review. Peter never did. Aldrich affirms in his editor’s note that he modeled George, Being George on Edie, the classic oral biography of Edie Sedgwick that Jean Stein (mother of The Nation‘s editor and publisher) and George Plimpton published in 1982. Edie is primarily Stein’s book; Plimpton was brought in to edit and organize Stein’s colossal stack of transcripts. Aldrich has chosen a steep mountain to scale. While George, Being George resembles Edie in form–pithy interview fragments, artfully arranged and configured, cascade down the page–the setting, tone and mood diverge considerably. Edie is about a privileged young woman’s descent into the Warholian abyss, where bohemian eccentricity collided with the berserk. What has Aldrich discovered? That Plimpton had affairs with a slew of young women and attended orgies in Manhattan in the 1970s. For the most part, there’s no comparison between Plimpton’s genteel milieu and the pandemonium of both the Factory and the psychiatric institutions that were a second home to Edie. And while George, Being George contains a stirring assemblage of voices (including Gore Vidal, Norman Mailer, Gay Talese and Harold Bloom), Aldrich’s cast pales in comparison with Stein’s dramatis personae: Capote, Robert Rauschenberg, John Cage, Jasper Johns and Warhol, to name a few. From these voices Stein and Plimpton sculpted passages that rise from the page and lodge in the mind. Ondine: “Those were the days I lived in Central Park. I’d wake up by the lakes and swim in them.” Gerard Malanga: “Andy [Warhol] would also probably deny being high on LSD, yet I found him at six in the morning [on Fire Island] rummaging through the garbage cans.” Henry Geldzahler: “When [Edie] was being paid less attention to, she didn’t know who she was. That possibility of destruction was built into the weakness of her personality. We have to get used to the reality that we’re alone. If you can’t get used to it, then you go mad. And she went kind of mad.” Nothing in Aldrich’s book is quite so fine as these passages. But what ultimately distinguishes Edie from George, Being George is the stagecraft employed by Stein and Plimpton, the drama they created through the scrupulous arrangement of voices into a rich, structurally coherent montage; Aldrich’s book is a less dynamic collection of skillfully orchestrated monologues. Still, aficionados of Plimpton, The Paris Review, the “quality lit set” and Manhattan’s upper crust will savor Aldrich’s book like a dry vodka martini. There was the Review to edit and the staff to hang out with; games to play at the Racquet Club; books and articles to write for anyone who would pay for them; New York ceremonies to MC; girls to make love with; and always, from every direction, the endlessly seductive pull of friendship to respond to. The only big changes in his life that followed chronology were his marriages–which, notoriously, hardly changed anything in his life. Some of the most illuminating sections of George, Being George concern the ongoing tension in Plimpton’s life between his journalistic output, his stewardship of The Paris Review and his myriad social and financial obligations. Plimpton’s literary career began auspiciously enough. In 1956 he launched a fruitful collaboration with Sports Illustrated; his first piece was about the “many-sided character” of Harold Vanderbilt and his success in the America’s Cup. It was in the pages of SI that Plimpton launched his forays into professional baseball and football, which in turn led to Out of My League and Paper Lion. The former is sprightly but somewhat weightless; the latter, by contrast, demonstrated what Plimpton, at his most resolute, could accomplish at the typewriter. Paper Lion has vivid details, exuberant humor, a powerful narrative arc and a polished, sophisticated diction, all of which suggested a young craftsman pushing himself to the limit. His early books on sports were wildly popular: in 1970 Time reported combined sales of nearly 2 million copies. The irony is that his whole “participatory” method was devised as a way to get a better picture of the subject–it wasn’t supposed to be about George. But over time, and more or less against his will, his celebrity became such that it overshadowed whatever else he might have wanted you to get out of the story. His persona was his livelihood, and it was also a kind of trap for him. But then that happens to a lot of successful public figures. If you want to say he was complicit in it, I suppose it was only by reason of the extraordinarily hard time he had saying no. He would have needed to tell it; he needed an audience. To write, to do great writing, you have to be alone, to have privacy, a private life. He was the most thoroughly social creature I’ve ever known. I think George experienced private life as a terrible deprivation; I think he would have preferred not to have one. Or perhaps his writerly inclinations at that point were better suited to a more modest undertaking, a book on the order of Lost Property: Memoirs & Confessions of a Bad Boy (1991), Ben Sonnenberg’s graceful account of his life as a hedonist and literary editor, or a collection of private jottings akin to his friend Kenneth Tynan’s dark and enthralling Diaries. In 1993 Plimpton produced “Death in the Family,” a learned essay about ornithology, for The New York Review of Books. Writing with melancholy and rage about the decimation of bird populations, he effortlessly chronicled the travails of the ivory-billed woodpecker, the whooping crane, the Micronesian kingfisher and Kirtland’s warbler. Birds were a subject about which he felt strongly, and on which he might have written, if he so desired, a fine and valuable book.